Ten teams are now expected to win 12 games or more in the regular season, with Melbourne in 6th separated from GWS in 10th by only 1.1 Expected Wins. Based on the latest replicates there's an estimated 39% chance that the team in 9th will be separated only on percentage from the team in 8th at the end of the home-and-away season. In the quest for a Top 4 spot, Port Adelaide made the biggest gains (+16% points), while the biggest losers were West Coast (-17% points), and Melbourne (-14% points). For the first time this season since we've been tracking these co-efficients, the average level of uncertainty increased this week, as nine teams finished the round less certain about their likely home-and-away finish than when they started the round. West Coast saw the largest increases in uncertainty about their final ladder position this week, though GWS, Hawthorn, Geelong and Melbourne also saw relatively sizeable increases. Melbourne now has the greatest uncertainty of any of the teams about its likely final ladder finish. It now has a 9% or higher chance of finishing in any of positions 3rd through 9th. The Western Bulldogs, who are now about 80% chances to finish in 13th, 14th or 15th, saw the largest decrease in uncertainty, and now find themselves only behind Carlton and Richmond in terms of certainty about final ladder position. 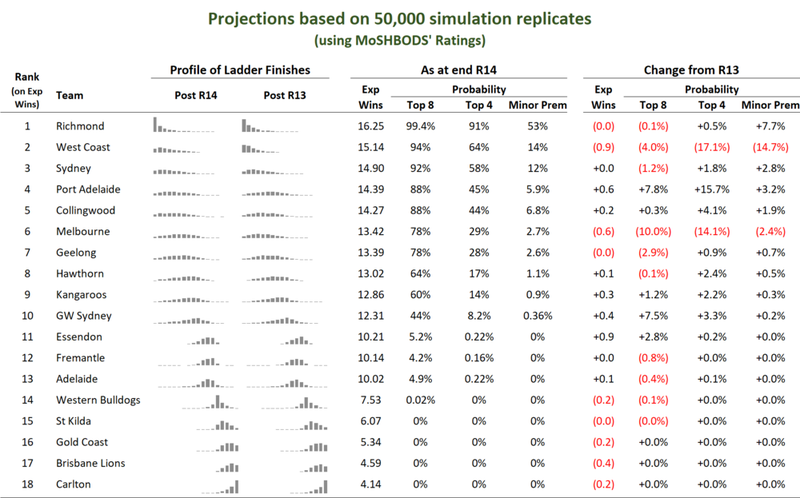 Carlton is estimated to have about an 88% chance of finishing bottom 3, and Richmond an 85% chance of finishing top 3. Overall, looking across all 18 teams, we saw an increase of 1.1% in uncertainty. Looking next at each of the ladder positions, we first focus on those positions where uncertainty increased most this week and where it remains highest. These are, it turns out, positions 2nd through 11th, all of which became less certain this week, and all of which are more uncertain than the eight other positions (1st, and 12th through 18th). Most uncertainty is now associated with 6th place, for which seven teams (Sydney, Port Adelaide, Collingwood, Melbourne, Geelong, Hawthorn and North Melbourne) have roughly 10% or higher chances of filling it. The largest increases in certainty this week was for 14th place, which Western Bulldogs and St Kilda are, combined, over 65% likely to fill. The position associated with least uncertainty remains 18th, however, it being almost 75% likely to be filled by either the Brisbane Lions or Carlton. 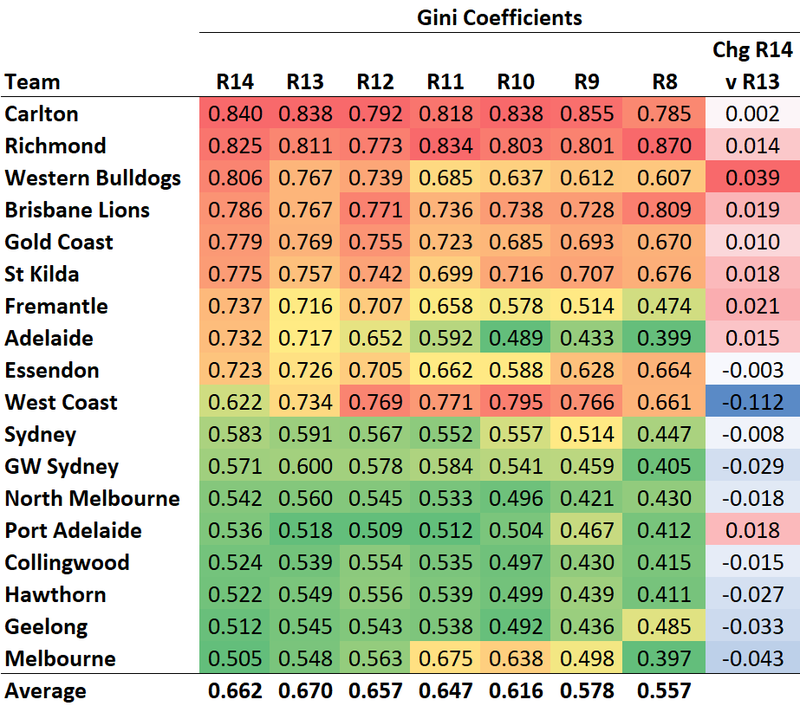 Geelong and Melbourne are now the teams most likely to make the Finals should they finish on 12 wins, but the estimated conditional probability of them doing this is below 40%. Fremantle, Essendon and the Western Bulldogs remain the teams least likely to make the Finals should they finish on just 12 wins, though Sydney, West Coast and Adelaide also have poor prospects with 12 and 10 seasons. Thirteen wins makes most teams 75% or better chances for a finals berth, excepting Fremantle, Essendon, Sydney and West Coast who'd all need at least 13.5 wins to achieve that level of certainty. Looking next at the analysis for Top 4 finishes, we see little change from the situation after Round 13 and find that no team has an estimated probability of such a finish greater than about 30% with only 14 wins. 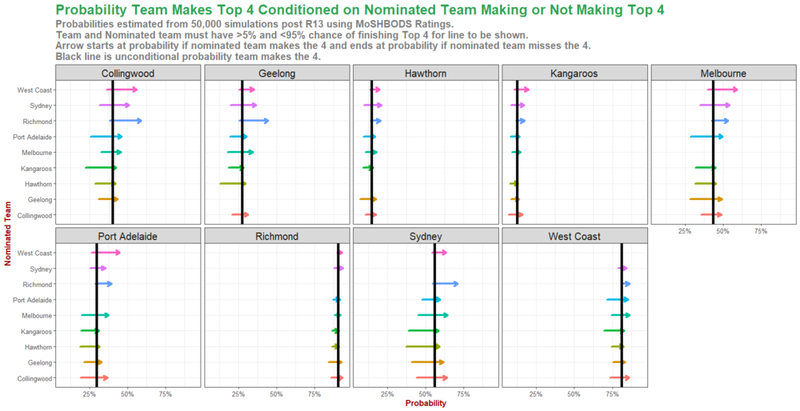 Richmond, Melbourne and Geelong still have the highest estimated probabilities, while West Coast, Sydney, Port Adelaide, Essendon and Fremantle have the lowest at around 15%. Fifteen wins, however, now gives every team at least an estimated 75% chance of a spot in the Top 4, and some estimates as high as 90%. By comparing the arrow lengths in the charts on the left (post R13) with those in the charts on the right (post R14), we can see that Melbourne, after their loss to Port Adelaide, now find their final 8 hopes more tied to the fates of the other teams vying for spots in the 8. 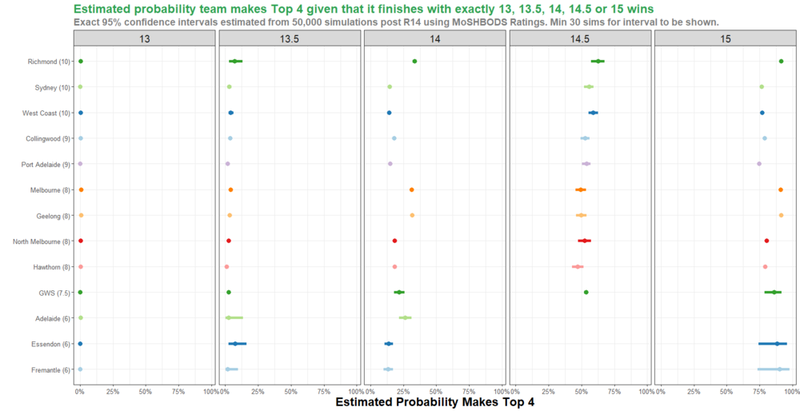 Conversely, Port Adelaide find their final 8 hopes less tied to the fates of the other teams vying for spots in the 8. Here we find that West Coast's Top 4 fate is now more intertwined with that of other teams that have genuine Top 4 aspirations, and Melbourne's fate slightly less so. Lastly, here's the updated list of the 30 most important games remaining in the fixture on the basis of their expected impact on all 18 teams' finals chances. GWS now has five games in the Top 10, North Melbourne four, and Sydney, West Coast and Hawthorn two each. Games that were also on the Top 30 list last week are marked with an asterisk. Nineteen of the 28 games that were on last week's list and that weren't Round 14 games are still on the list. Eight of the new games on the list involve North Melbourne, whose win this week obviously boosted their Finals chances and, accordingly, made their future games most important for the makeup of those Finals.